Okinawan dietary habits have received a lot of attention lately. Many researchers and otherwise-curious individuals make pilgrimages to the island in hopes of discovering the secret to the famed longevity of its people, and more than a few of them believe that the secret lies in the island's food. Although that remains to be proved, it’s worthwhile to try it out. The local food reflects the influence of the many Southeast Asian cultures that Okinawa used to have extensive trade ties with during the days of the Ryukyu Kingdom. Subsequent circumstances added Japanese and Western flavors. Following are some of the most common local foods that people on the island eat daily. Okinawan culture can be defined in one word: champuru. The actual meaning of champuru is “to mix together,” and champuru culture refers to the fact that Okinawa has mixed together a number of distinct elements that make up the fascinating culture that exists today. 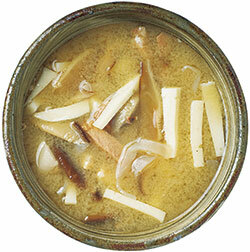 As a result, champuru foods can be viewed as the essence of Okinawa. A champuru is usually named for its main ingredient, although it can contain several different elements. Just as people have various ways of thinking, each person has his or her own special champuru recipe. Goya champuru is one of the most common of champuru. Translated as “bittermelon” and in season during the summer, goya has a green skin and bitter taste. 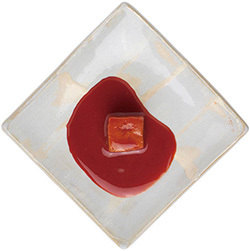 Served at many restaurants, Goya champuru includes goya, tofu, pork, eggs, salt and soy sauce. Goya gives the champuru an exotic flavor and a healthy quality. Stir-fried vegetables with fu (wheat gluten), a very healthy food rich in vegetable protein and often used in Asian food. 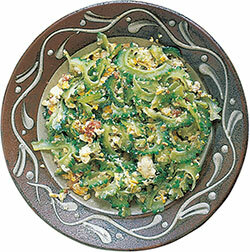 Champuru means “to mix together,” and stir-fried fu champuru is one of Okinawa’s main such dishes. Found at local restaurants serving Okinawan food and at local grocery stores. 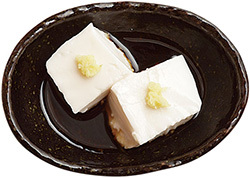 The flavor of Tofu champuru is similar to that of Goya champuru. There are not many differences between the two, although in this case tofu is the main ingredient. It is seasoned with salt and soy sauce. Although a fruit, papaya is often used like a vegetable. 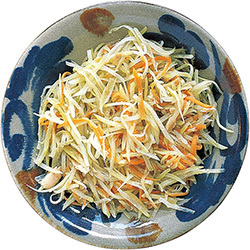 When added to champuru, papaya is cut into thin strips, fried and mixed with carrots and other vegetables as well as with tuna or canned pork. It is then seasoned with salt and soy sauce. Resembling a cut-up potato, papaya is said to be good for the health. A dish traditionally served on festive occasions in Okinawa, with its origins in the royal cuisine of the Ryukyu Kingdom. Ina means “wild boar” and muruchi means “pseudo”; inamuruchi is an imitation of a wild boar dish using pork along with shiitake mushrooms and steamed fish paste, all cooked in a sweet soup with white miso paste. Available at most restaurants serving Okinawan food. 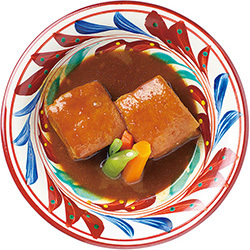 A traditional Okinawan dish in which chopped pork belly is slowly simmered with soy sauce or miso, brown sugar and awamori. The pork becomes tender and free of extra fat because of the long cooking time. Compared with their counterparts in the mainland, Okinawan shallots are smaller in size and much stronger in aroma. Normally served with flakes of dried bonito and soy sauce after light pickling with salt. Also good for tempura. 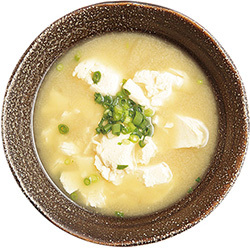 A clear Japanese-style soup with bonito broth and a nutrient-rich sea vegetable called asa, or sea lettuce, and characterized by a refreshing scent reminiscent of the ocean. Dried asa can be purchased at shops selling local specialties as well as at most supermarkets. 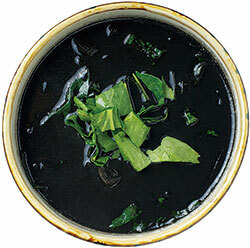 This rich soup contains white squid broth and miso mixed with squid ink, a common ingredient in Okinawan food. Squid ink soup is normally found at eateries adjacent to fishing ports. The term suku* means “young rabbit fish,” and karasu (*same as garasu) is a generic term for salted fish. 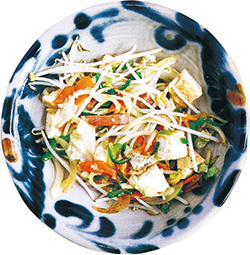 Its saltiness perfectly complements the simple flavor of Okinawan tofu. Popularly eaten with awamori. *Fishing for suku is a seasonal tradition in Okinawa that takes place around the first days of the sixth and seventh months of the lunar calendar, the only time of year when large schools of suku appear near the coast. 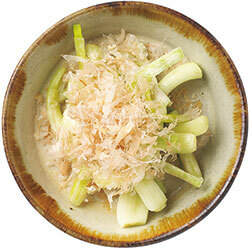 A delicacy essential to court cuisine, tofuyo has a distinctively rich cheese-like texture. It is made with dried tofu that has been fermented in a mixture of awamori and red koji, a method that originated in China. A popular dish served with awamori. 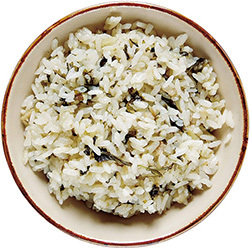 Fuchiba is Okinawan dialect for mugwort leaves, and jushi is a rice dish prepared with a choice of ingredients including pork and vegetables. 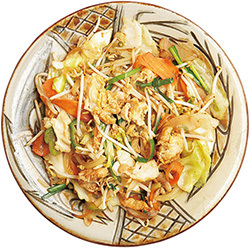 Fuchiba jushi is often served as a side dish to Okinawa soba at local eateries. Mugwort is an herb with a characteristic aroma, known for its property as a natural antidote. Tebichi boiled with carrots, daikon (Japanese radish), tofu and konbu (seaweed) and seasoned with soy sauce. Tebichi means “pig’s feet” in Okinawan dialect. Nitsuke describes a kind of food that is boiled and seasoned with such condiments as soy sauce. Tebichi produces a rich gelatin when boiled and helps keep your skin young. Shredded carrot stir-fried with egg and tuna, seasoned with only salt and pepper. 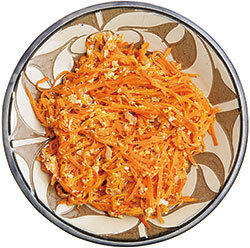 Nutritious and easy to cook because you use the whole carrot. It is very healthy and high in minerals, fiber, vitamins, iron, potassium and calcium. Very soft tofu with a consistency similar to that of yogurt or pudding. It is made from soy, like regular tofu, but after nigari (from seawater) is added to liquid pressed from soybeans, it doesn’t set like hard tofu. 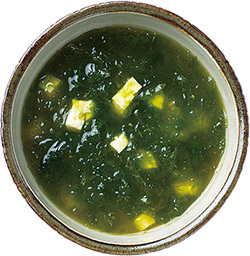 Nigari is high in minerals such as magnesium and potassium, is often served by itself and is sometimes cooked in miso soup. It is available at local grocery stores. A variety of seaweed found in the waters surrounding Okinawa. “Umi” means sea and “budo” means grapes in Japanese. 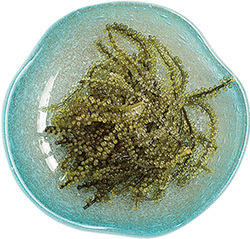 This seaweed resembles grapes and is eaten after dipping it in vinegar soy sauce and ponzu (citrus vinegar). Peanut butter tofu. It is made from potato starch and liquid squeezed from peanuts. A little chewy and sweet, it’s like an Okinawan dessert. You can eat it with grated ginger, wasabi, sweet soy sauce dressing or brown sugar syrup. Also available at local grocery stores. 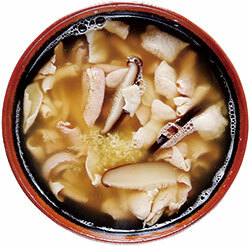 A fish stock soup with pork entrails and other ingredients such as pork meat, konyaku and shiitake mushrooms. Pork entrails are cooked by constantly changing boiling water to eliminate the odor. 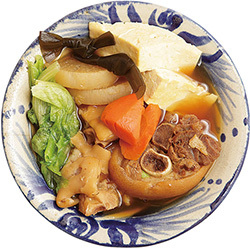 This soup is typical of Okinawan cuisine, in which every part of the pig is utilized. Okinawa was the recipient of rich cultural influences from other Asian nations through a bustling trade during the days of the Ryukyu Kingdom. American culture came into the lives of the people with the US administration of the island that followed World War II. With the added impact of Okinawan immigrants in Hawaii and South America before and after the war, Okinawan culture evolved as a reflection of diverse foreign cultures, often seen as the charm of this island. This aspect of mixed culture is also found in Okinawa’s cuisine, appreciated as much by locals as traditional fare. 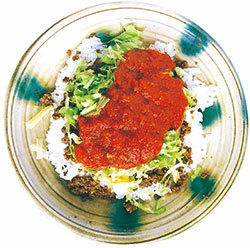 Taco ｒice is an Okinawan dish using taco ingredients that have been put on rice. Despite the origins of the taco and the American fast food chain Taco Bell, Taco rice is believed to have been created in Okinawa and has become an integral part of the island's food culture. Canned pork, or SPAM, was introduced from the States to Okinawa after World War II. 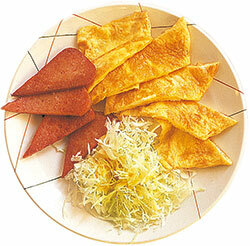 It is believed that Okinawan immigrants in Hawaii created Pork tamago and then introduced it back to Okinawa. Since then, it has become a mainstay of Okinawan cuisine. A large number of Okinawans emigrated to Argentina and Peru about 100 years ago. Many of them eventually returned to Okinawa, bringing with them the food culture of their adopted homes. 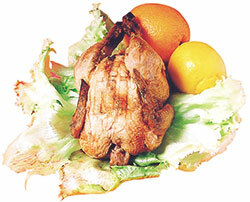 Rotisserie chicken is one example. Grilled with a lot of garlic, a whole chicken is usually priced at between ¥1,000 and ¥1,500.